Some notes on Firms, designers and makers. They were printing at Old Ford in 1772 Richard Adams and Samuel Lay of Old Ford were unfortunately bankrupted in March of 1786. London textile printers founded by he brothers George Percival and James Baker in 1884. 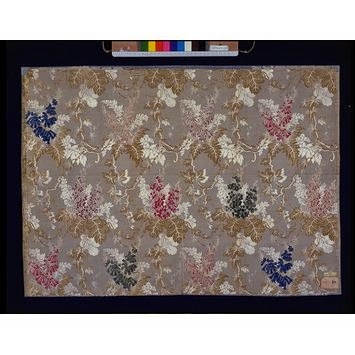 George formed and important collection of historic textiles (mainly Persian and Indian) and many of these designs were adapted and block printed for Bakers by Swaisland and Co. at Crayford. In 1893 they took over Swaislands. 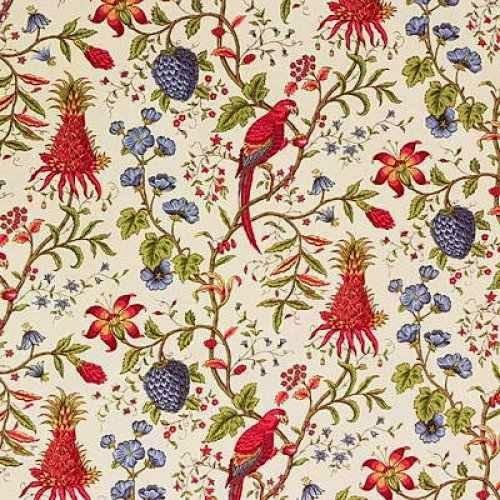 Famous for their 1890 Art Noveau printed fabrics and skilled adaptations of historic designs. Now owned by Parker Knoll. Premises at 19 Friday Street, Spitfields. You can see samples at the Victoria and Albert museum in London. Including this one. 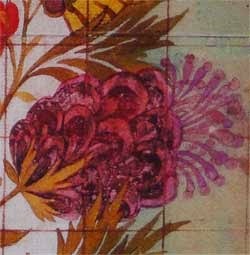 Silk designer and naturalist who lived in Moorfields. He worked for James Leman (17 of his designs have survived) but achieved distinction as a botanist, ornithologist and entomologist and wrote two treatises now in the British Museum. A volume of 119 water-colours by Dandridge dating from before 1710 of the arachnids, accompanied by meticulous notes, is in the Sloane Collection of the British Museum and is designated Sloane MS 3999. W S Bristowe discovered that this work had been used without acknowledgement by Eleazar Albin in his Natural History of Spiders and other Curious Insects of 1736. This is just a glimpse into textiles in this country. I hope you have enjoyed the history of it as I have by finding out for myself.... History and textiles two of my favourite things. I enjoy history and love genealogy, In fact I have gone back to the 1600 on my Dads side..... Some things I have found out!! wish he was still here for me to laugh with him about.